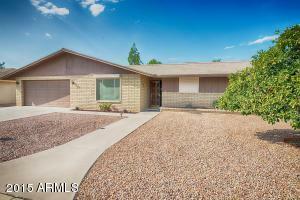 Solid block home in popular Chandler neighborhood is located close to everything and in walking distance to school. New paint everywhere inside complements new carpet and lots of new tile. The bathroom and kitchen counter tops have been resurfaced, and the cabinets in both bathrooms have been refinished. A large glassed-in Arizona room looks over a pool with a thrifty variable speed pump. Other highlights include a whole home soft water system, a newer tankless water heater, a RV gate that leads to a car or motor homes parking area that features a natural gas vehicle refueling station by Fuel Maker, and electric exterior window security shades by Roll Shutter Systems that keep out the sun and provides ultimate window protection. A newer economical 13 Seer Combo Gas HVAC has a service contract, and lots of ceiling fans means cool summer time living. Three closets outside the bedrooms means ample storage, and one can double as a pantry. Low maintenance yards means no mowing, and Morningstar Turf installed in part of back yard in 2014 has a 15 year warranty. The 2 car garage has lots of room for storage or use as a workshop area and workbench, with a pull down ladder leading to a loft for all of your storage needs. North/south exposure lot. Washer and dryer included.